I'm a participant on a lot of online car forums, especially those that deal with smaller vehicles. For years, I hear the grip that the manufacturers don't advertise the smaller cars (e.g. Yaris, Fit, Versa, Mazda2, etc.) much if at all. For years I've heard, "If they'd just do some advertising, they might sell more of them," or, "They didn't even have a [INSERT CAR HERE] at my local auto show!" Well, there's likely a reason for that, and the reason is simple: profit. Most A- and B-segment cars simply don't have much profit margin. 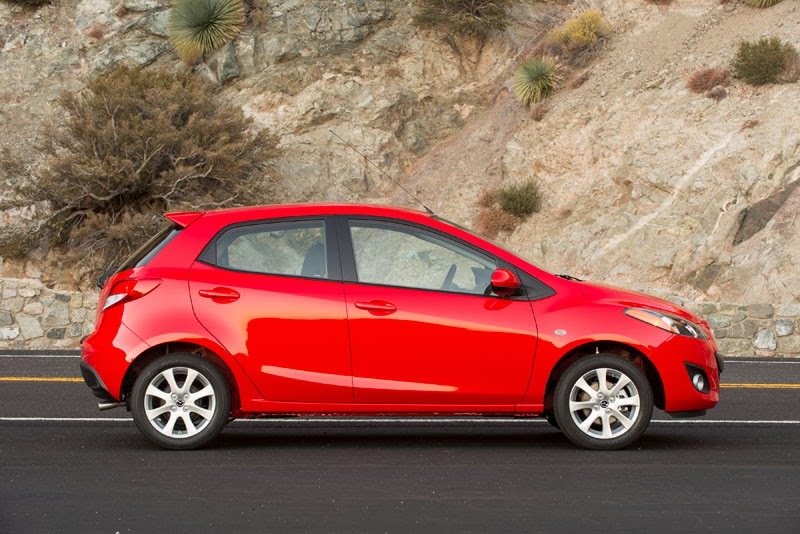 For example, a 2014 Mazda2 Sport has as an invoice price of $15,320 and an MSRP of $15,515. That's a measly $195 of profit, assuming the dealer sells you the car at full MSRP. And let's face it, not many people want to pay the sticker price. But if the dealer can talk you into a 2014 Mazda3 hatchback instead, the profit margins are much better. The invoice on a 2014 Mazda3 i Sport hatchback is $18,916, and MSRP is $19,740—$824 in dealer profit. So yes—the Mazda3 is potentially 323% more profitable than the Mazda2. This is why you don't see many dealers advertising the hell out of the small cars. In fact, Ducati Scotty and I were doing some test drives last weekend as he's looking to replace his beloved 1997 Honda Civic CX hatchback. We actually stopped at a Mazda dealer to look at a Mazda2 and Mazda3. The Mazda3, while a very nice car, wasn't what Scotty was looking for, so we drove a Mazda2. Unfortunately, it also didn't fit the bill. It was late Sunday evening, business was slow, and we started chatting with the sales guy and his manager, who were very personable. At some point, we got on the topic of margins. One of the sales managers said to us that, after everything is said and one, they lose $795 on each Mazda2 the sell. While I find that kind of hard to believe, I know they're not rolling in the dough every time they sell off a Mazda2. But there's certainly something to be said, especially after looking at the small difference between invoice and MSRP on many of these small vehicles, not just Mazdas. So, next time you wonder why an automaker isn't marketing the hell out of their entry-level vehicle, remember that it probably doesn't pay to do so. But, it may just bring you into the dealership, and they just might be able to get you into something bigger, more expensive, and more profitable. I don't doubt that there really is a $795 loss on paper between MSRP and invoice on the Mazda 2, but with incentives and other deals they rarely actually pay invoice. Even so, I think they don't make much if anything on the sale of the Mazda2 itself. As with other cars, the real money is in upselling, accessories, extended warranties and the like. The markup on all those things is way higher than what's on the car. That "$795 loss" on each one sold sounds an awful lot like the old radio ads from some very large (California) dealerships. The "we lose money on every car we sell, but we make up for it in volume!" line. Yeah, right. Limited supply could also be an issue - I know that when the Honda Fit was first launched they cancelled the ad campaign almost immediately because demand exceeded supply and stayed that way until well into the second generation.